Whether you are working where there is danger of flying debris, are at home mowing the lawn or playing an active game of basketball, wearing prescription safety glasses is important for protecting your eyesight. What Are Prescription Safety Glasses? Safety glasses are manufactured with non-prescription or prescription lenses. Non-prescription safety glasses, also referred to as "plano" lenses, are made to be worn by individuals that do not need to wear glasses to correct problems with their vision. Prescription safety glasses are worn in place of an individual's regular glasses at times when vision safety is a concern. The prescription lenses are made to the specifications of the individual's needs as determined by their eye care professional. The alternative type of safety glasses to prescription safety glasses are wear-over safety glasses or goggles. These types of safety eyewear are worn over the person's regular corrective eyeglasses and usually are not very comfortable to wear. In 1970 the United States government passed the Occupational Safety and Health Act which states that all workplaces provide their employees with working conditions that are healthy and safe. The government formed an agency within the Department of Labor called The Occupational Safety and Health Administration, known as OSHA. It is this agency's job to make sure that safety regulations are followed. OSHA also assesses the safety needs of industries, determines if new regulations and guidelines are needed and sets industry standards. For both prescription and nonprescription safety glasses, as well as other protective eyewear such as goggles, welding helmets and face shields, OSHA uses the standards set by the American National Standards Institute, or ANSI. Unlike the safety glasses from the past, prescription and non-prescription safety glasses of today are lightweight, stylish and fit comfortably. There are designs and sizes made specifically for men, women and children, providing a good fit for different sized faces. People that wear prescription eyeglasses can usually buy safety glasses from an optical store or from their eye doctor. However, often their choices of frame styles and manufacturers are limited. 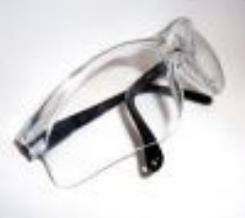 Safety glasses with prescription lenses are available from many online suppliers of protective eyewear. These companies generally offer a wide variety of styles, designs and manufacturers. Frames Direct offers safety glasses with prescription lenses in a variety of frames from various manufacturers ranging from budget friendly to designer names. In addition to other frame manufacturers, Safety Glasses offers Wiley X frame prescription safety eyewear. Safe Vision offers prescription eyewear in traditional and specialty safety fame styles. Today's prescription safety glasses are manufactured in a wide variety of beautiful stylish frames and fashionable lens shapes.